SS Robin Hood, sunk by U-575 under Günther Heydemann on 16 April 1942. 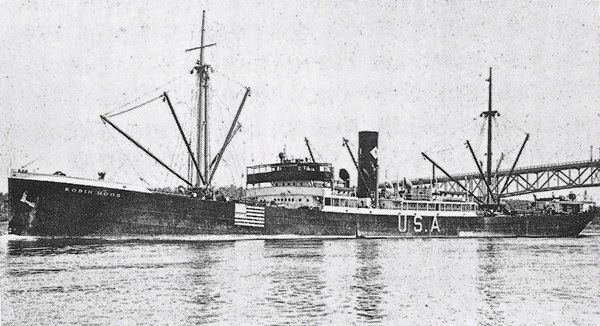 The US-flagged steam ship Robin Hood was built by the Skinner and Eddy Corporation of Seattle Washington in December 1919 as yard number 73. She was commissioned and built for the US Shipping Board (USSB). She was 6,887 gross registered tons (GRT), 425 feet long, 55 feet wide and 33.5 feet deep. The ship was propelled by a steam turbine General Electric engine which developed 637 net horsepower and propelled the steel hull at 10.5 knots. In the spring of 1942 the Robin Hood was owned by Seas Shipping Company, Incorporated of Corlandet Street, New York. The firm was also known as the Robin Line. At the outset of World War II the firm had 11 ships, all but one of them beginning with the name “Robin”. They were in a service from New York to Baltimore, Cape Town and Mombasa, East Africa. According to the Oakland Tribune of April 28th, 1925, the ship was then operated by the Argonaut Line and was making great speed between Baltimore and Oakland with mostly steel and iron products. Argonaut Line was a division of the American South African Line of 26 Beaver Street, New York. Their main route was to the Pacific. In March of 1927 the Robin Hood was back in Oakland, according to the Tribuneof March 21, 1927. Her captain as named McKenzie and she carried a general cargo from Baltimore to Parr Terminal. By 1927 the ship was owned by the Robin Line (Seas Shipping Co.). The ship was bound as far north as British Columbia, then back to the US east coast via the Panama Canal. The ship’s call was newsworthy enough that in both instance they were accompanied by photos. During the Second World War but before the US was directly involved, the Robin Hood was reported sighting “a suspicious vessel under Swedish colours” on the 12th of November, 1942 in the South Atlantic. This turned out to be the SS Tisnaren laden with Allied airplanes but the British took note of the report and dispatched HMS Devonshire to investigate. In March of 1942 the Robin Hood loaded a cargo of 8,725 light tons. This included 4,500 tons of chrome ore, 800 tons of asbestos, and general cargo including sisal, skins, wood, gold and copper concentrates, liquor, cocoa, and wolfram ore. Her draft forward was 27’ and aft 28’. Robin Hood loaded in East Africa and proceeded to Boston via Cape Town and Trinidad for bunkers. The voyage went uneventfully except that on the 9th of April it sent a radio message about another suspicious vessel in the North Atlantic, possibly compromising her own position in doing so. The ship was unarmed, so there were no gunners aboard, and there were only two lifeboats. It is not known whether there were rafts aboard, but since there is no mention of them it can be assumed there were not any. On her final voyage the ship’s master was Captain John A. O’Pray. There were 37 men under him. All of them were US citizens except for Able Bodied Seaman Frederick C. Pedersen of Denmark and Second Cook Pedro A. Peralta of the Philippines. There were also 2 passengers on board, named Hall M. Newhall and George Davis, so the total number of persons on board was 40. The ship left Trinidad on Tuesday the 7th of April with orders to pass east of Grenada and Barbados, then “NW to 32-01 N, 66-45 W; N. to 39-01 N, 66-45 W” On the night of Wednesday April 15th 1942 the ship was approaching its destination, as it was 210 nautical miles southeast of Nantucket and 395 nautical miles northwest of Bermuda. Her course at the time was 343 degrees true north northwest, and Captain O’Pray was adhering to the British zig zag patterns 11 and 34. Speed was 10.7 knots through the water. It was a dark and cloudless night with winds were southwest in the 14-20 knot range, a choppy sea and lots of phosphorus in the ship’s wake. There were two look-outs, one on each wing of the bridge, with Third Officer Richard T. Chapin manning the starboard bridge wing. 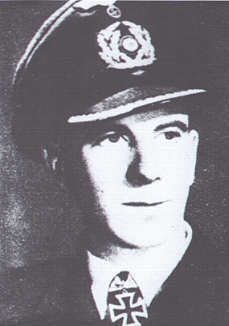 Kapitänleutnant Günther Heydemann, skipper of U-575 which sank Robin Hood. Unbeknownst to them, Robin Hood was being stalked by U-575 under Günther Heydemann. At 9:42 pm local time Captain O’Pray was in the chart room on the bridge when Second Officers Curtis W. Denton called him to say that a torpedo fired from astern had just passed along the starboard side close by. O’Pray ordered a hard turn to port, but then another torpedo struck the side at the number three hatch. This caused the boiler room to explode and filled the air with cordite and steam. Some of the crew believed that a third torpedo struck 50 feet behind the first, however others believed that the concussion was actually the ship tearing apart as a result of the first blow. The trauma to the ship’s hull was so extreme that it “lifted the deck and folded it over,” as well as blowing out hatches one and two forward and knocking down the foremast. Captain O’Pray had Radio Operator Benjamin Pinz send the rather vague message “SOS POSITION UNKNOWN,” however since the aerials were down it is doubtful whether this message was received ashore (it wasn’t). In any event, Captain O’Pray did not enjoy a strong working relationship with Pinz, who along with Messman Adolph P. Moses “had been trouble makers on the voyage prior to the attack, grumbling at and criticizing the orders received from their officers.” O’Pray did manage to send the confidential codes overboard in a weighted canvas bag. Because the starboard lifeboat was smashed, 26 men out of a complement of 40 (24 sailors including the two passengers) managed to get away in the port lifeboat. The boat got away at 9:45 pm and two minutes later, at 9:47 pm, the Robin Hood broke in half just forward of the number three cargo hold and broke in two and sank. According to O’Pray he was “blown off bridge and hauled into lifeboat.” This might account for, or have contributed to, his nerves. Up until that point she had been settling on an even keel. Once broken in two the bow raised then sank, and the stern briefly floated with the poop raised in the air before it too sank. The submarine motored off at 9:50 pm, without Heydemann having interacted with the survivors. It would be over a week before help arrived. During that time Captain O’Pray managed to keep morale high and rationed his supplies well. As for the fate of the 14 sailors and officers left behind, little is known of their fate. Unless they managed to get away in a damaged lifeboat or life raft, they would have been either killed in the explosion or drowned when the ship sank. Apparently distracted by the broken rudder and the heavy seas, the 26 men in the other lifeboat did not linger to determine their fate. Among the dead the most senior was Third Officer Richard T. Chapin, followed by Bosun John Mulligan. There was an able-bodied seaman (Isias Enduzy), two ordinary seamen (Freitag and Ramirez), 1st, 2nd and 4th assistant engineers (Seaman, Allen, and Lindley), and Oiler (Caronias), two firemen (Glemby and Nickersen), a wiper named Hoffman, Chief Cook Wright and Messman Sherrad. The three engineers were almost certainly killed in the engine room when the boiler room exploded. USS Greer, DD 145, was under command of Lieutenant Commander L. H. Frost. 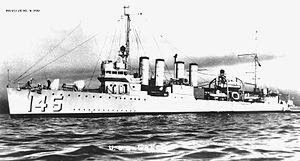 In the fall of 1941 she fired on a German ship three months before the US officially entered World War II in what became known as the “Greer incident.” About seven weeks earlier the destroyer had rescued 13 men from the merchant ship Equipoise on 1st March 1942. The ship had been sunk by U-160 off Cape Henry on 27 February. The Greer was built by William Cramp and Sons Ship and Engine Building in Philadelphia and launched 1 August 1918 as part of the Wickes-class. She was decommissioned (laid up) between 1922 and 1930 and between 1937 and 1939. USS Greer DD 145 which rescued 26 survivors from the Robin Hood in April 1942. According to the Greer’s War Diary of Thursday April 23rd, at 10:06 am local time she “Sighted flare ahead and small boat with sail up. Proceeded to investigate.” At 10:20 she “Approached boat and picked up twenty-six (26) survivors from torpedoed ship S.S. ROBIN HOOD….”. At 10:30 “Shelled lifeboat and destroyed it.” At noon they received ordered from the Commandant in Bermuda, Admiral James, to make for that island. The position where the Greer rescued the Robin Hood survivors was roughly 50 miles west southwest of where the ship had been sunk. It was roughly 300 nautical miles north northwest of Bermuda. At 3:40 pm the Greer informed Bermuda that their eta was the following day and that two of the merchant sailors would require medical attention. The Oakland Tribune reported that the Robin Hood men (the ship’s name had to be censored) were “safe in port today after spending eight days in a lifeboat,” based on an Associated Press wire story that went out from Hamilton on the 25th of April. The New York Times scooped the story on the 24th of April (publishing it in their April 25th edition). The article continues: “Some of the men were described as “in very bad shape.” Most of them are suffering from swollen feet. It is understood that the men who were lost died in the lifeboat.” This last statement contradicts the notion that 26 men entered the lifeboat at the time of the attack and 26 exited it – all alive – in Bermuda, and that at least three men died in the explosion in the engine room. New York Times, April 25, 1942, “26 Survivors Reach Bermuda,” Special Cable to the New York Times. Newspaperarchive.com for the articles from the Associated Press (Zanesville and Frederick above and below). Oakland Tribune of April 28th, 1925, “Freighter From Atlantic Making Good Time Here, Robin Hood of Argonaut Line, Due Here in Few Days, Left April 7.” “Ships and Shipping” section.